Aircraft engines run at high power settings for extended periods of time. In general, the engine runs at maximum power for a few minutes during taking off, then power is slightly reduced for climb, and then spends the majority of its time at a cruise setting—typically 65% to 75% of full power. In contrast, a car engine might spend 20% of its time at 65% power accelerating, followed by 80% of its time at 20% power while cruising. 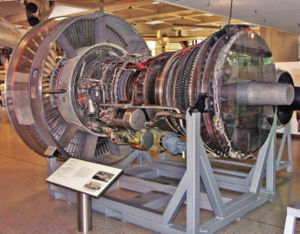 The power of an internal combustion reciprocating or turbine aircraft engine is rated in units of power delivered to the propeller (typically horsepower) which is torque multiplied by crankshaft revolutions per minute (RPM). The propeller converts the engine power to thrust horsepower or thp in which the thrust is a function of the blade pitch of the propeller relative to the velocity of the aircraft. Jet engines are rated in terms of thrust, usually the maximum amount achieved during takeoff.